**Available in limited quantities. Supply is inconsistent on this item. Do not use for long-term collections. Suggested (more reliable) alternate is item GF2578T. 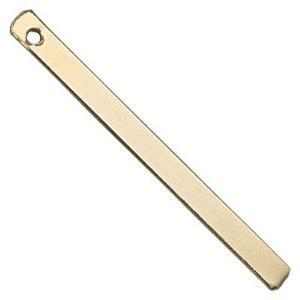 Gold-filled 20 gauge narrow vertical bar pendant blank for use as a geometric design element in layered chain necklaces and other jewelry design ideas. Learn more about gold-filled jewelry supplies on our blog 5 Things You May Not Know About Gold-Filled.